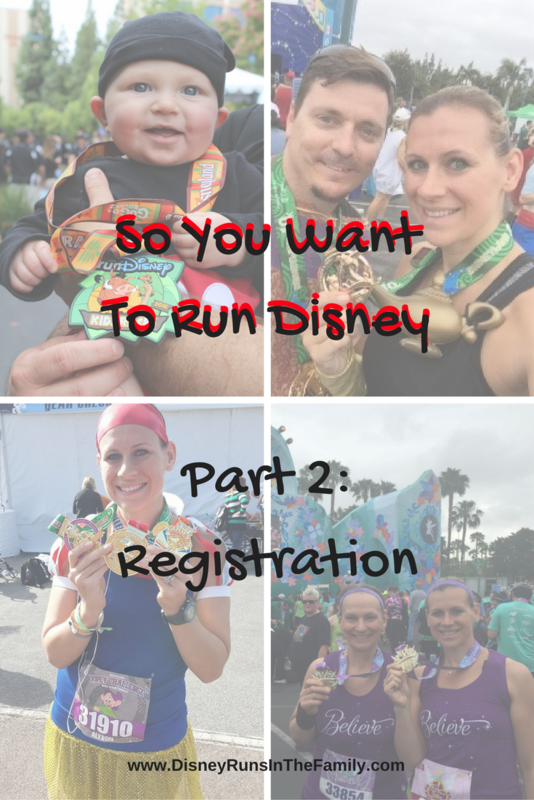 We are on to Part 2 of the “So You Want to Run Disney” series! If you missed Part 1: Choosing your race, check it out HERE. Now that your heart is set on one race, a series of races, or all of the races, it’s time to get registered. This can be just as hard as running! Don’t say we didn’t warn you! SPECIAL NOTE: the runDisney climate is changing from when this was first published. There are races that you have some breathing room on, so make sure you read on to figure out if you need to take the day off work to register or you can exhale. Typically, runDisney opens registration about 9-11 months before the race date (this past year, they pushed registration and it keeps getting earlier). You can sign up for reminders at rundisney.com, but I wouldn’t wait for the reminder! They are often emailed after the race registration opens and sometimes even after the race is already sold out. You can find the dates for registration up many places, including on our Facebook, Twitter, and blog pages. I always mark my calendar and be sure to schedule my availability. Races usually open at noon EST, 9:00 PST. These times have been consistent for quite a few years now, but it never hurts to recheck. You will want a few things ready for your registration. You will be asked all the basics—name, birthday, address, etc. You will also need to indicate if you are participating in any special categories, such as the military division. There is also a place to indicate if you are completing your Coast to Coast. One important piece of info you will want to have handy is your proof of time. In order to be placed in a corral with runners that are at similar speeds, you need to submit a previous completed race time from a registered race. For half marathons, this must be a 10k or higher; for the full, a 10-miler or higher. If you do not have a previous time, you will be placed in the last corral. You can update that time in the future if needed. You will need: the name of the race, city/location, date, official time, and the link to the race results. Yes, I always have to look it up. Also note that the race had to have been run somewhat recently. runDisney.com will list the cut-off dates (it's usually within the past 2 years). You will also want to login to www.active.com BEFORE registration begins! Create your account and have it open--this will be especially important if you have to register more than one person. I would also recommend you follow runDisney on Twitter. That is where they will continually update registration news the morning of registration. Don't forget to follow us too (@FitFunLife) for updates and information. Does Disney Run in YOUR Family? If so, note that you will have to complete totally separate registrations for each person in your family. If you are registering another adult, you will need their Active account information. Get your credit card warmed up, because it will get good use during registration. You will want to note that in addition to the price listed from runDisney, active.com will add their fees, which will increase the price. Plan for $15-$20 in fees for the mid-range races. A quick note about challenges: runDisney is really getting into the race weekend challenges. If you plan to run a challenge, such as the Dopey Challenge or the Disneyland Double Dare, you must register for that challenge to receive all the benefits of the challenge. You will not get the challenge medal or shirt if you sign up for the races individually. When you register for the races, you’ll be given the opportunity—isn’t that nice that they give you an opportunity—to also pre-purchase some commemorative items. For us, we always get the pins. It’s the one thing I have from every single Disney race I’ve run. They often also sell necklaces (yes, I’m wearing my Dopey necklace as I write this) and sometimes other merchandise including jackets, tumblers, magnets, tons of stuff. Recently they also have done bundle packages. Don't stress out that day, though. You can order the items afterwards too, but don't hesitate too long. When they sell out, they sell out (and this option is getting much more popular). Early registration often occurs for Disney Vacation Club owners and Disney Annual Passholders. You can register more than one person using these links. The links will go live at a specified time/date on your landing page for each of these groups, typically the Thursday prior to the regular registration date. What happens if you miss out and the race is full? You always have the option of running with a charity group! It’s a great way to raise money for some amazing causes and still get all the benefits of running the race, usually with extra bells and whistles. Of course, you can always do both: register on your own AND run for a charity! Also, you can find a travel provider that has bibs. At times you may be required to purchase a room and/or tickets with the bib purchase. You can find authorized travel providers at runDisney.com. We've done this a few times and have had great experiences! So which races do you need to worry about? Remember, the climate HAS changed (when we first posted this series it was an all out frenzy!!!). The 10ks, 5ks, challenges, and kids races are still hot commodities. Out of those, I think the challenges sell out last. My personal recommendation would be, in this order: kids races, 10k, 5k, then challenge. The reason I've started putting the kids races at #1 is because travel providers and charities usually do not get kids race bibs. There is no other option, so if I want Robby to run, I've got to get him registered first! So now you are armed and dangerous! 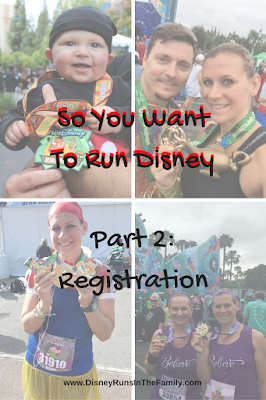 You have everything you need to know to register, stress FREE for you next runDisney event.